If you are experiencing shoulder pain, it is essential to see your doctor immediately to develop proper plan of care. However, if you cannot see a doctor in the near future, there are many ways you can soothe shoulder pain yourself at home. Depending of the type of shoulder pain, there are a variety of at home remedies that you can use for treating shoulder pain. The best treatment you can give yourself for shoulder pain is to not to overexert yourself. This means, if you are experiencing pain in shoulder, use it as little as possible. Playing a game of Tennis with a bad shoulder can only make the pain worse. Resting your shoulder will help it recover from any traumatic injuries. If you have shoulder pain, be sure to position yourself in a way that feels comfortable while sleeping. This will prevent yourself from reinjuring the shoulder in sleep. Three helpful tips to sleep with shoulder pain are: sleeping on your good side, folding a pillow to support the shoulder in pain, and adding another pillow behind your back so that you don’t roll over. 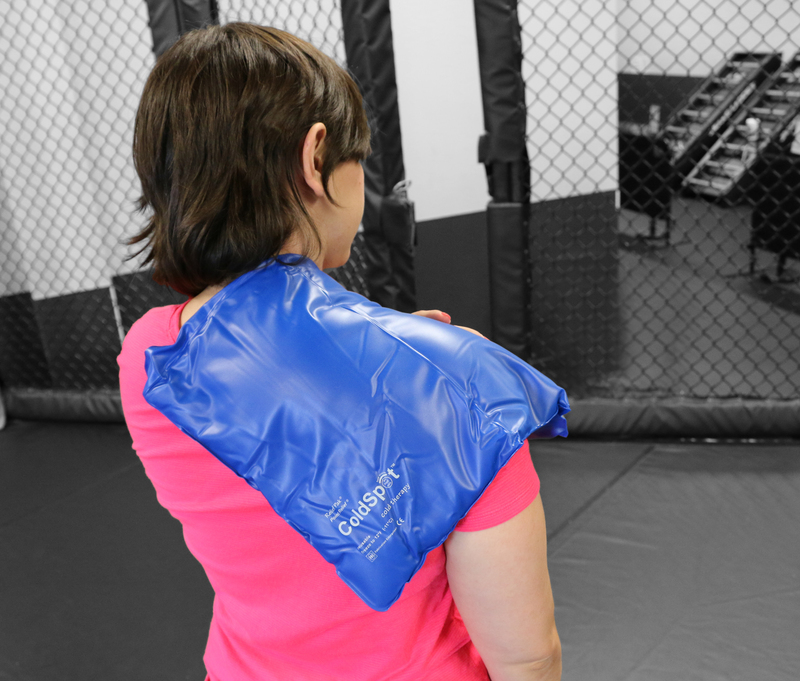 For swollen tendons and stiffness in the shoulder, it is good to apply ice or cold packs. For an effective method of applying cold therapy to your shoulder, look no further than Relief Pak® ColdSpot™ Blue Vinyl Cold Packs. These reusable packs remain soft even when below freezing and continue to maintain their therapeutic temperature level for up to thirty minutes. Simply place the pack in a chilling unit or freezer until frozen and then apply. Cold therapy can reduce swelling and temporarily soothe shoulder pain. Seeking out your doctor is the best way to treat shoulder pain. While recovering or waiting for treatment it is always a good idea to apply a cold pack, not overexert yourself, and sleep in a comfortable position. To view our selection of cold packs, click here. To view the pillows we offer, click here.